As gamers, we pay attention to the type of computer hardware we use. For some, graphics cards are the most important thing. For others, a high quality audio experience. No matter what we focus on, we’re all going for the same thing. The ultimate goal is to create a realistic gaming experience. Very few people are able to take this further than those of us who enjoy flight simulators. No matter how advanced the graphics are, how accurate the in-game physics are, or how many hours you have behind the keyboard, nothing can simulate the feeling of being in a real airplane cockpit like a true-to-life recreation. While flight sticks and pedal controls are considered essential, there are plenty more tools that can help you enhance your flight simulator experience. With the Saitek Pro Flight Radio Panel, Logitech has given realistic radio controls compatible with the latest flight simulators. Let’s go hands-on and see what this accessory has to offer. 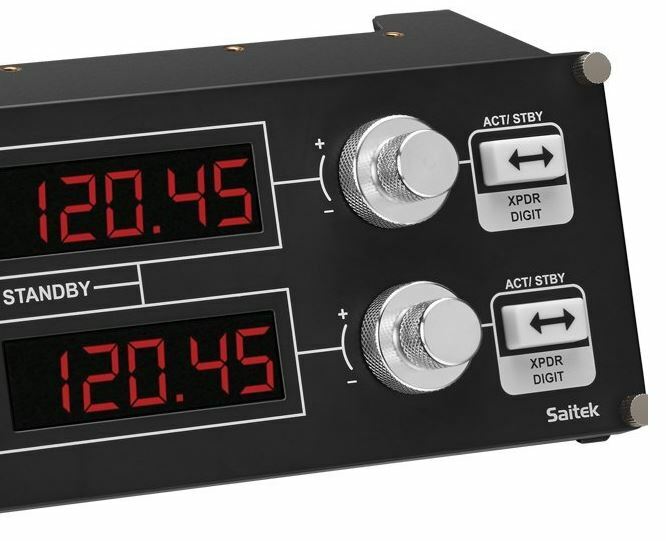 Logitech’s Saitek Pro Flight Radio Panel, as the name implies, is a recreation of the real radio panel used in many flight simulators. Analog style com selector knobs, frequency dials, and classicly styled LCD displays create some that looks like it was just ripped from the cockpit of a decommissioned plane. While radio panels are reasonably new, almost all of the modern flight simulators are now taking advantage of this unique control system. Microsoft flight simulator is by far the most popular flight simulator on the market, and this radio control panel is compatible with both version X and 2004. 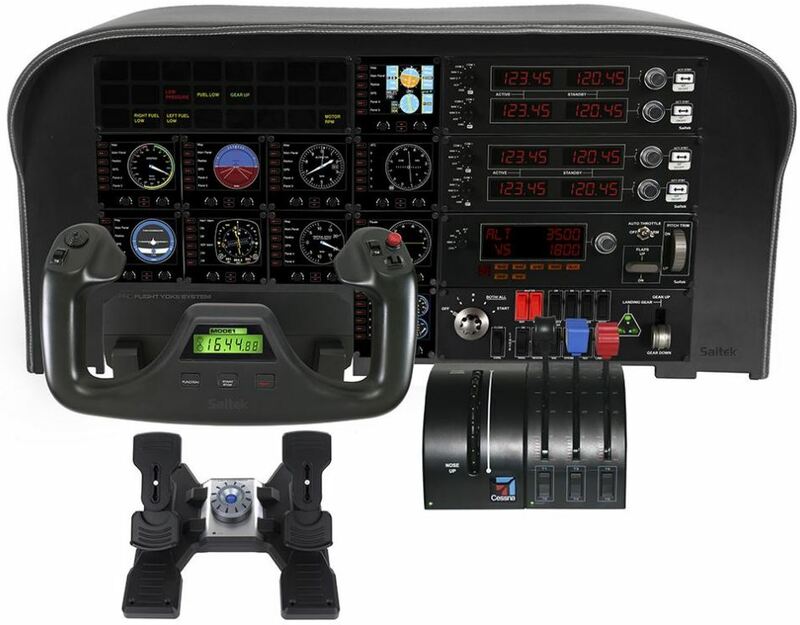 If you own the pro flight yoke, these radios will integrate right into the panel. That being said, Logitech isn’t going to lock you into their own design. These radios are the same size as real life ones, so they’ll work in every realistically sized flight cockpit. Since it’s launch, updates have been made available for X-Plane and Prepar3D, covering almost all of the popular flight simulators. While most of these flight simulators run on both PC and Mac operating systems, PC gamers will have the most compatibility. On OSX, this radio panel will only operate with X-Plane version 10 and higher. The other options are restricted to PC only. In this case, all you need is windows 7 (or higher) and a spare USB 2.0 port. This panel uses very little power, and if you’re using it as part of a kit you’ll probably have a lot of peripherals on hand. Fortunately, these low power requirements mean that you’ll have no problems using a USB hubb. Will every flight simulator use both displays? Will all of the buttons be necessary? Well, not always. With this design, logitech stayed true life. If you’re running a more advanced flight simulator, every feature that could possibly be used will be there. If you’re running a simpler one, you might only need a few. In our eyes, it’s important that they included all of the features. This ensures that whatever flight simulators come out in the future, you’ll have the hardware necessary to take advantage of them. What, exactly, do all of these buttons, knobs, and lights do? 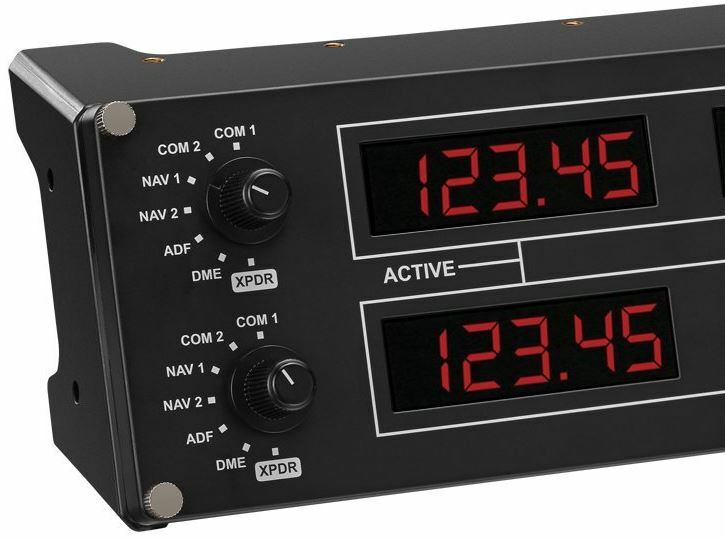 Well, if you’re using a flight simulator like Microsoft’s FSX, you’ll probably be familiar with them as this simulator has a realistic recreation of this radio panel in-house. But other simulators use a modified version, making it easier to use with a keyboard and mouse. Depending on the model of your virtual plane you’re flying, you’ll have one to four radios on hand. A single panel controls two radios at a time, which are stacked on top of eachother. Each of these radios can be assigned to a specific purpose. Com, Nav, ADF, DME, or XPDR. Each option comes with a different set of frequencies, depending on the type of plane and where in the world you are flying. This frequency range is transmitted to the panel over the included USB connection, so it’s always accurate. Each radio has two separate displays. Your active display shows the current frequency you are on, and the standby frequency shows the one that you can switch to at the touch of a button. Hitting the ACT/SBY button flips these frequencies. Your active frequency becomes the standby, and the radio is tuned to whatever frequency you had dialed in on your standby display. The silver knob on the right allows you to tune the frequencies. At first, it looks as if it’s just one big fancy knob. But there are actually two dials there. The larger dial at the back is your fine tuning adjust. It changes every frequency past the decimal point. You could tune from 120.45 to 120.46, and so on. The center knob adjusts the frequencies before the decimal point. This radio panel isn’t just restricted to tuning the radio. It can be used for various aspects of flying. What settings are available depend on the flight simulator you’re using, but the control panel lends itself well to any setting that requires precise incremental adjustment. Logitech’s flight control panel is surprisingly well made. 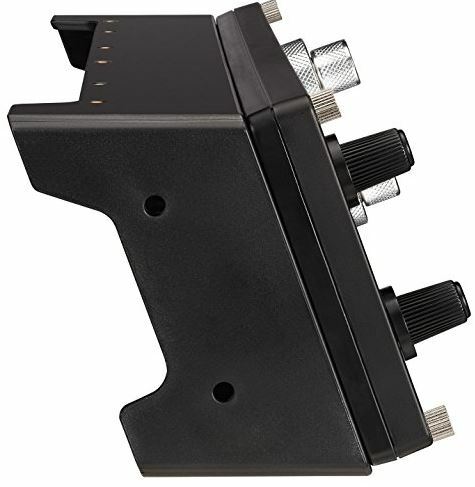 The entire enclosure is made from a thick, rigid plastic, that has four very realistic looking torque screws holding it in place. The quality of the components used is most evident in the weight. This is not an incredibly advanced piece of hardware, but it does have a bit of heft to it. All of the mounting points where it screws into your flight simulation system are reinforced with metal. This allows you to torque down the screws with enough force to hold it firmly in place, without having to worry about it shifting around or moving. All of the diagrams and labelling is screen printed directly onto the face of the panel. This means that it’s not going to fade, peel off, or strip, even if it gets scratched from use. This isn’t incredibly common in the gaming controller industry, but a very nice touch. The motion of the dials is something that we especially appreciated. You move through the incremental adjustments with a firm “click” at each level. With a little practice, we were quickly able to span a large range quickly while still dialing in on exactly the point we wanted. When you’re trying to juggle 10 things at once while preparing for landing, this kind of easy to use controls are exactly what you need. With the exception of Flight Simulator X, most software requires a special plugin to be used with this radio control panel. After all, this type of control is a cut above what most users go for, and most developers weren’t expecting this kind of innovation with the launch of their software. The downside to this is that you do require a few extra steps. You’ll have to go to Logitech’s website, download the plugin, and install it. As with any 3rd party add on, if there is an update for your flight simulator you’ll want to make sure that the plugin is compatible before you update. Generally, Logitech is very good about this kind of support. It’s just important to remember that you’re not dealing with something your flight simulator vendor officially supports, so you’ll need to be a little cautions when upgrading. If you’re looking to build an ultra-realistic home flight simulator system, the Logitech G Saitek Pro Flight Radio Panel is for you. One of our biggest pet peeves with the Saitek panel was that there are just so many darn spaces. If you leave them empty, your system looks pretty weak. But if you’re filling them up with unnecessary add-ons, you’re simply wasting your money. The in-flight radio systems are particularly painful to control with a mouse. To top it off, they’re something that you need to be actively using during takeoff and landing. This is a time where you’ve got a lot of different things going on, and anything that can make your life easier during this time is a worthwhile purchase. This is one of those controllers that, once we’ve used it, we can’t see ourselves going back. Nothing is more satisfying than hitting a button, getting your landing instructions, and starting to take action. While this is just one piece of the puzzle, it’s something that will help you take your game to the next level. 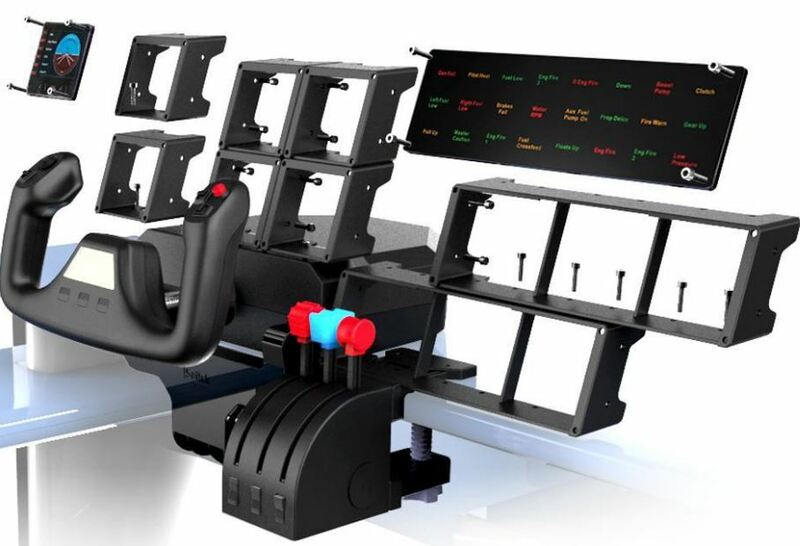 Still planning your flight simulator system? Before you get too far, make sure you check out some of the other reviews we’ve done. We took a look at the best HOTAS Joysticks, as well as the best Yokes for flight simulators.